In a public square in Beijing in 1904, multiple murderer Wang Weiqin was executed before a crowd of onlookers. He was among the last to suffer the extreme punishment known as lingchi. Called by Western observers "death by a thousand cuts" or "death by slicing," this penalty was reserved for the very worst crimes in imperial China. 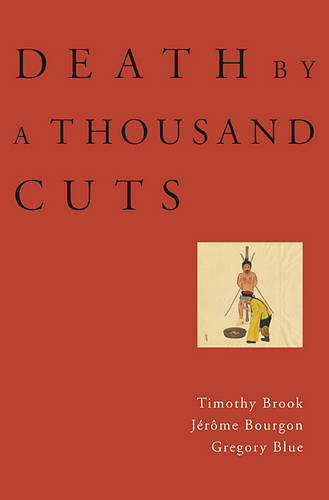 A unique interdisciplinary history, Death by a Thousand Cuts is the first book to explore the history, iconography, and legal contexts of Chinese tortures and executions from the tenth century until lingchi's abolition in 1905. The authors then turn their attention to an in-depth investigation of "oriental" tortures in the Western imagination. While early modern Europeans often depicted Chinese institutions as rational, nineteenth- and twentieth-century readers consumed pictures of lingchi executions as titillating curiosities and evidence of moral inferiority. By examining these works in light of European conventions associated with despotic government, Christian martyrdom, and ecstatic suffering, the authors unpack the stereotype of innate Chinese cruelty and explore the mixture of fascination and revulsion that has long characterized the West's encounter with "other" civilizations. Compelling and thought-provoking, Death by a Thousand Cuts questions the logic by which states justify tormenting individuals and the varied ways by which human beings have exploited the symbolism of bodily degradation for political aims.